BY NIGHT / NOĆNA from Restart on Vimeo. By night... shift, story, street. Experimental documentary short film about Zagreb's street washers in the form of the dense photo essay (887 photographs) which uses technique of stop animation to achieve temporal sequence. Zagreb's ''sprayers'' are shown in two characteristic areas: conspicuously empty city, and quietly full spaces of the company ''Čistoća'' (''filling station'', cloakrooms...). Repetitive, highly aestheticized frames of washing contrasted by unexpected, unabated, ''darkened'' tone reveal very intimate and everyday characters of washers. The film's end is nothing more than an intended mistake inspired by the impression that the washer's job can never be finished – it can only be suspended till the following night. 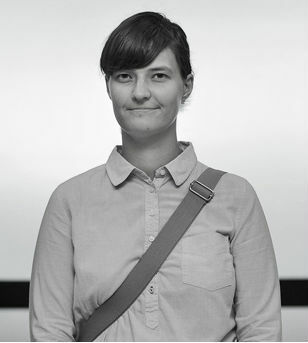 Lucija Bušić was born in Zagreb in 1985 and she still keeps returning to this city after every journey. At the age of 24 she graduated at the Faculty of Economy in Zagreb. At the end of the same year she got employed as a photographer on tportal, where she is still working. She tends to use digital – analogue border for differentiating professional and personal work. The former one enables the financial means for the latter. CYCLE OF YOUNG AUTHORS 2011./ 2012.